What’s up, forex friends? Did you know that the Loonie has been one of the strongest currencies year-to-date (as of March 1, 2016)? Heck, it’s now winning out against pretty much all its major forex rivals, as y’all can see on that there table below. In fact, the Loonie’s only losing out to the safe-haven Japanese yen, which is quite understandable since safe-haven flows have pretty much been streaming towards the yen. And even then, the Loonie has actually been fighting back bitterly against the yen in the past couple of weeks. So, what are some of the major factors driving the Loonie higher against its forex rivals? Time to find out! As y’all learned from our School’s lesson on How Oil Affects USD/CAD, the Loonie is positively correlated to oil since oil products account for more than 20% of Canadian exports. Having said that, oil prices have now stabilized and are even climbing higher. The most recent oil rally is generally being attributed to the mid-February deal between Russia, Saudi Arabia, Qatar, and Venezuela to freeze output at January levels in order to slow down or outright stump the slump in oil prices. And confirmation that another meeting mid-March has been scheduled between OPEC and non-OPEC oil producers has been keeping the rally alive. Of course, oil ain’t the only factor that’s pushing the Loonie higher since USD/CAD has actually sort of decoupled from oil, as y’all can see on that there chart above. On to the next factor sustaining the Loonie rally! If you look at that overlay of Loonie pairs below, you’ll notice that the Loonie began to broadly gain strength against most of its forex rivals on two separate occasions: (1) the later half of January and (2) early February. What happened then? Let’s tackle the January period first. The major catalyst at this time was arguably the Bank of Canada’s (BOC) decision to maintain the overnight rate at 0.50%. If y’all can still recall, pundits were split 50-50 on whether the BOC would cut rates or not. However, the BOC actually refrained from cutting rates and even sounded a bit upbeat, causing the Loonie to give its forex rivals the boot a full day before the intraweek oil rally (at the time) even started. Pop Quiz! Who make up the vast majority of all trading volume in the forex market and play mainly for the Benjamins? Well, the answer’s already in the title, but if you didn’t know, then head on over to our School’s lesson on Market Players. 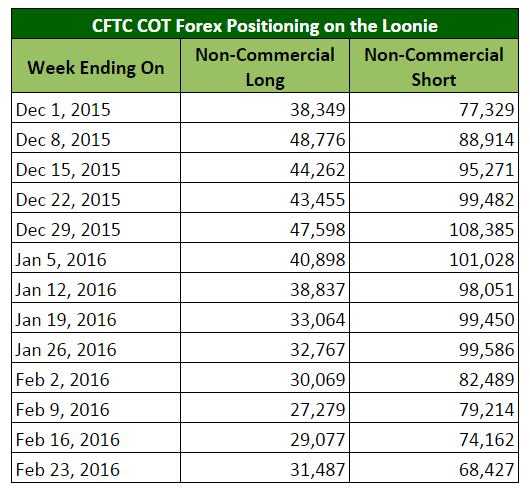 Anyhow, if you’ve been following Forex Ninja’s weekly write-up for the COT report from the CFTC, you may have noticed a trend in forex positioning on the Loonie. If you haven’t then check out that nifty table and that swanky chart below. What that shows is that non-commercial forex traders, which include the ginormous hedge funds being run by 1,000 year old immortals like George Soros, have been unwinding their short positions on the Loonie after peaking at 108,385 contracts during the week ending on December 29, 2015. Unfortunately, the COT report only shows us how the large forex traders are positioned – it doesn’t tell us why. But if the big boys (and girls) are unwinding their Loonie shorts, then something must be up, right? At the very least, the Loonie could keep going higher if they keep unwinding their Loonie shorts. Looking forward, the oil rally is still fundamentally weak and driven mostly by speculation since Saudi Arabia has vehemently refused to consider cutting back on oil output, and the same can be said of Russia. Also, oil inventories are currently at record-high levels, which highlights the fact that the oil glut is still here. Not only that, U.S. oil production continued to ramp up and even managed to hit a 43-year high in 2015. And as I mentioned in my Quick Primer and Some Updates on Crude Oil, the U.S. has just shipped its first “Liquid American Freedom” overseas, so the U.S. is likely here to stay, which tips the scale in favor of more downside risks for oil prices, and hence, the Loonie. In short and in connection to BOC Deputy Governor Timothy Lane’s speech that I mentioned earlier, the next likely move from Canada would be fiscal (taxes, government spending, etc.) rather than monetary (rate cuts and all that), which is gonna be good for the Loonie since it reinforces the idea that the BOC won’t be cutting rates again anytime soon. As for the unwinding in Loonie shorts by non-commercial forex traders, I don’t really have anything more to add to that except that you may wanna check out Forex Ninja’s blog from time to time in order to see if there are noticeable shifts in positioning. 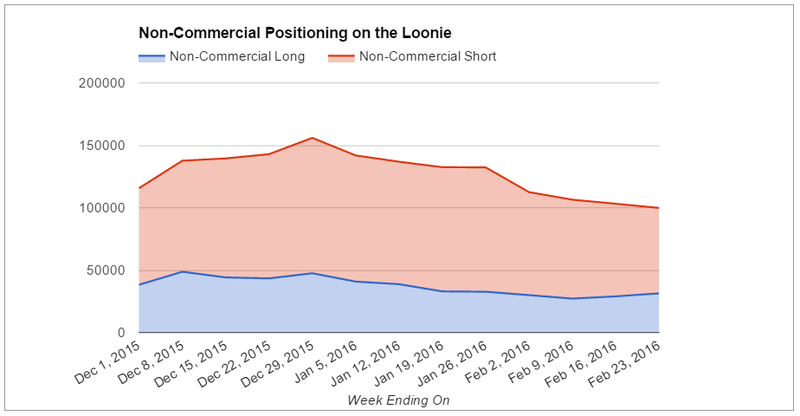 Although I should also note that the large speculators are not loading up on the Loonie, so we may be seeing a top soon enough if or when non-commercial forex traders finish dumping all of their Loonie shorts.